The Book of Cassiel - The Archangel of Saturn. For those with their Birth Sign on the Astrological Sign of Capricorn December 22nd - January 20th and Aquarius January 21st - February 19th. 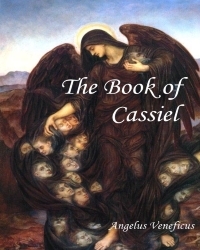 The Book of Cassiel introduces to the reader and student of angelic lore the unique magick of this archangel. A short history forms an introduction then what follows is the practical Kabbala of the Archangel, which concerns itself with the various method of communicating with the Archangel Cassiel. The importance of the Moon, not only as a means of contacting Cassiel, but also in the practice of the Pauline Art. The Author discuss's the magical script of Cassiel, inks, perfumes and incense for those that wish to make their own. The Seal of Cassiel and his signs. The reader is also introduced to the Olympic Spirit of the Saturn, appropriate talismans and meditative exercise suitable for angelic contact. This unique eBook may also form part of a complete Angelic Grimoire if you wish, by combining other archangel eBooks. The Book of Cassiel has been reviewed and where necessary corrected and concepts clarified. I have also added new Archangel and Moon Talismans and their applicability to the Pauline Art. These include Talismans from the Armadel, Picatrix, Ars Paulina (The Lesser Key of Solomon) , and Liber Lunae or The Book of the Moon. This second review has aligned The Book of Cassiel with The Grimoire of the Archangels. In order to add power to your rituals I have also added a number of Mystical Hymns of Orpheus from my book, "Hymns for the Archangels". which may be used for mediation and invocation. Research brings to light new information all the time, especially when you are researching the Traditional Archangels. This update has been completed to bring this eBook in-line with the Grimoire of the Archangels. To purchase this Book use the PayPal link in the left-hand column.